There are still only anime-original episodes scheduled through the end of April. The 23rd of March was for some reason expected by many long-time fans to be the first part of the adaptation of the next case from the manga. I honestly can’t imagine why anyone would think that under the present circumstances. 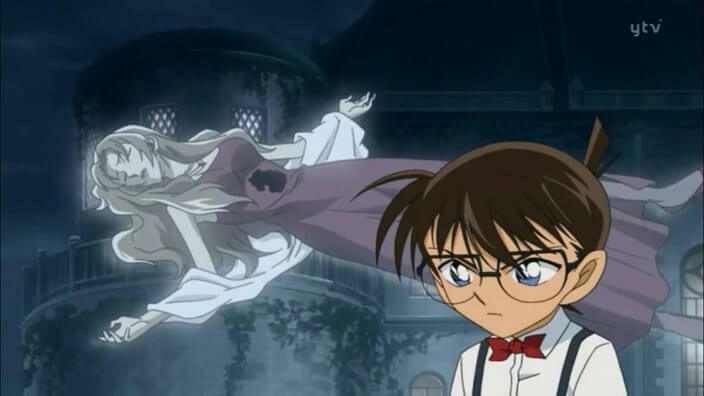 Anyway, a single-part anime original will instead air on that date, episode 935, titled “A Fortune Teller and Three Guests.” And if you can’t guess what the basic premise of that one will be from that title, welcome to your first Conan story. The anime is planning to re-air episodes 746 and 747 on the 30th of March and 6th of April. These episodes are a two-part series titled “Kaitou Kid vs Kyougoku Makoto,” which is based on manga chapters 862-864. These episodes are being broadcast to hype up the 23rd movie, which will have its theatrical premiere on the 12th of April in Japan. If it were following the pattern from previous years, an anime original intended to advertise the movie would air on April 6th. However, this year they are instead going to air past episodes that are highly relevant to the premise of the film. Personally, I would be happy if they chose to continue doing it this way from here on out. Those so-called “tie-in” episodes were always a waste of time that had no relationship with the movies, whether in story or tone. The rest of the anime schedule for April has been filled in. We can look forward to an AO followed by a two-part AO. Unfortunately, there are still no manga-based episodes in the foreseeable future. First on the chopping block is episode 936. It is a single-episode case titled “The Food Court Conspiracy” and will air on the 13th. Following that is a two-parter encompassing episodes 937 and 938. It will be titled “The Giant Talos’s Certain Kill Punch” and will run across the 20th and the 27th.